Daddy Pig has a new synthesiser. Peppa, George and Mummy Pig have fun finding and sampling sounds from around the house. 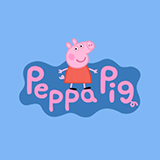 Peppa Pig was broadcast on ABC4 Kids at Wednesday 17 April 2019, 17:41.